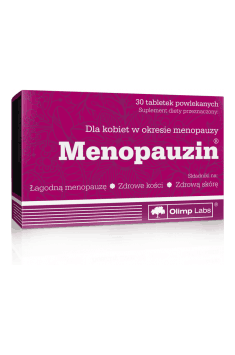 Olimp Menopauzin is a dietary supplement containing ingredients that support the alleviation of menopausal symptoms – soy isoflavone extract, hop extract, vitamins D, E, B6, folic acid and chromium. Soy isoflavones, obtained from various soy species, are called phytoestrogens. They exhibit estrogenic properties due to the estrogen-like chemical structure. The main soy isoflavones include daidzein and genistin. Studies show that soy compounds may prevent the development of cardiovascular disease, as a result of the beneficial effect on the lipid profile of the blood. In addition, soy isoflavones may have a protective effect on bone mineralization. Both clinical studies and epidemiological data show that the regular intake of phytoestrogens affects the alleviation of menopausal symptoms. A standardized extract containing soy isoflavones showed efficacy in clinical trials. After a 3-month period of use of phytoestrogens, women examined reported reduction of tiredness, depressive moods and pain as well as lowering of excessive sweating and hot flushes. Common hop (Humulus lupulus L.) is a perennial whose medicinal raw material – cone, has a natural estrogenic, sedative and anxiolytic effect. It can prevent and relieve mood disorders accompanying menopause, including neurosis. It was also shown that the intake of hop cone extract reduced the vasomotor symptoms of menopause, especially hot flushes. Calcium and vitamin D are the basis for the prevention of osteoporotic fractures. Osteoporosis is a disease that increases the susceptibility to fractures as a result of the decreased mineral density of bones. It often occurs during menopause due to the accompanying hormonal changes. Available meta-analyzes indicate the efficacy of calcium and vitamin D in reducing the risk of bone fractures in postmenopausal women. Calcium is an element necessary for optimal bone mineralization. Vitamin D regulates calcium homeostasis and also improves the bone mineral density by increasing the absorption of calcium and phosphorus. In addition, it increases the strength of muscle cells, improving motor performance, and thus - reducing the risk of falling, which can lead to bone fracture. Chromium is an element involved in the metabolism of glucose, cholesterol, proteins, and fats. It is helpful in case of impaired glucose tolerance, helping to maintain glucose and insulin levels at the correct level. It also has a beneficial effect on the lipid profile of the blood. Studies show that chromium is also helpful in women during menopause. One study showed that 60-day chromium supplementation reduced calcium excretion in urine and increased dehydroepiandrosterone (DHEA) levels, suggesting possible anti-osteoporotic properties of this element. B vitamins are essential for the proper functioning of the nervous system and optimal energy metabolism. Vitamin B6 and folic acid reduce fatigue and lower the level of homocysteine – an amino acid that is a risk factor for cardiovascular disease, including atherosclerosis. In postmenopausal women, the level of homocysteine increases due to decreased estrogen synthesis. Biotin strengthens the immune system and helps to maintain healthy skin, hair, and nails. Vitamin E shows a strong antioxidant activity, thanks to which it protects cellular structures against the effects of free radicals. It is essential for cardiovascular health and has anti-aging effects. Antioxidant protection is especially needed for women during and after menopause, due to the deficiency of estrogens with specific antioxidant effects. In conclusion, Olimp Menopauzin is a preparation that comprehensively supports the alleviation of menopausal symptoms, improves bone health, mental balance and healthy skin appearance. It is recommended for women during menopause. Kupiłem swojej Mamie z nadzieją, że wróci do normalności, i fakt trochę to trwało, ale przestała być non stop rozdrażniona, przestała też narzekać, że jej gorąco, przestała narzekać na bezsenność, wróciło dobre samopoczucie i ta pogodna kobieta, która mnie wychowała. Dobry prezent dla każdej Mamy po 50-tce. Take 1 tablet a day after a meal. Soy isoflavones are particularly helpful in the second phase of menopause when the estrogen level in the body decreases. When struggling with the menopausal symptoms, in addition to adequate supplementation, one should also remember about a healthy, properly balanced diet. As to reduce hot flushes, it is helpful to give up caffeine and alcohol. Microcrystalline cellulose – bulking agent, potato starch, magnesium stearate - anti-caking agent, polyvinyl alcohol, polyethylene glycol, talc, potassium aluminum silicate, polysorbate - glazing agents, titanium dioxide - coloring. Microcrystalline cellulose - filling substance, potato starch, magnesium stearate - anti-caking agent, polyvinyl alcohol, polyethylene glycol, talc, potassium aluminum silicate, polyoxyethylene sorbitol monooleate - glazing agents, titanium dioxide - a color. Hops (Humulus lupulus) - plant of the same family as hemp, of which the raw material is female inflorescence – cone, containing a few to several percent of the lupulin (resin-bearing glands of cones, it is in the form of powder with a taste of bitterness containing waxes and essential oils, antibacterial), it is the source of many active ingredients (such as asparagine, quinones, flavonoids, tannins). Preparations containing hops are calming, supports digestion by increasing the secretion of digestive juices, reduce the risk of disorders of the digestive system. Hops are part of preparations to enhance relaxation after workout, sleeping pills recommended especially during intense training and during the competition, for the elimination of excessive stress and to calm down after using excessive doses of stimulants (e.g. Caffeine).